Ghayal is a story of a man who goes beyond l;imits to get what he wants, a man who rapes the girl he thinks he loves just for the sake of his ego. He torments her, and this mishap leads to unfortunate events as she loses her fianc�. Will she ever overcome the misfortune of life? Will she ever find her happiness? Cast : Asad Siddiqqui as Moiz Gohar Mumtaz as Adil Sumbul Iqbal as Tooba Shehzeen Rahat as Tania and others. 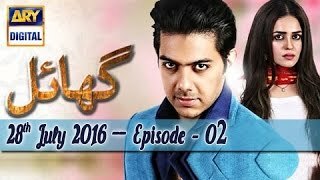 Director: Furqan T Siddiqui Writer: Shagufta Bhatti Timing : Watch �Ghayal� Every Thursday at 8:00 pm only on ARY Digital.